Liartown, USA is Sean Tejaratchi's (previously) incredible, longrunning visual surreal satire site, and it is the latest casualty of parent company Verizon's decision to purge the site of all NSFW content effective Dec 17. Tejaratchi writes, "I expect many posts will no longer be visible, and I’ve already noticed nonsexual material is being flagged. I wouldn’t bet on much being left up." He's going to leave his archive intact, but has few hopes it, and will not be adding to it (he's exploring the possibility of setting it up somewhere else). 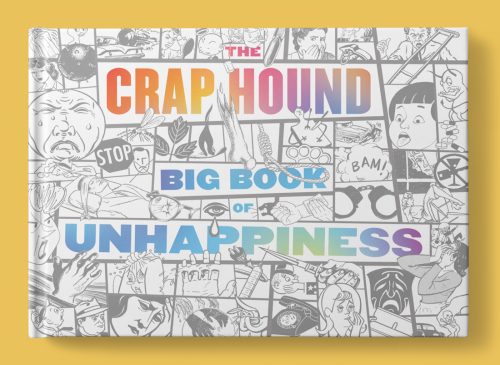 But it's not all bad news: Tejaratchi has also announced a new 544 page book celebrating his incredible found-art collage zine Crap Hound (previously), to be published by Feral House before next fall: it's a collection of unhappy people in bad situations. I didn’t want to make an anthology, so this book will basically be an enormous, horizontal tenth issue devoted to images notable for their lack of positivity. There will be men, women, children, and even pets in states of confusion, pain, fear, stress, anger, embarrassment, sorrow, depression, and frustration. There’ll be headaches, upset stomachs, storms, earthquakes, fires, floods, vehicular collisions, weight issues, drugs, suicide, murder, execution & punishment, atomic bombs, unemployment, riots, injuries, falls, fistfights, tantrums, and the silent, nocturnal shame of bedwetting. I’m including accessories (syringes, knives, pills, crutches, splints, etc. ), and imminent unhappiness (e.g. roller skates on stairs and overloaded electrical sockets). From the tearful sting of a scraped knee to the ominous shadow of impending planetary doom, you can expect a rich tapestry of trouble. I’ve been collecting unhappy material for more than fifteen years. As of today, it stands at FIVE HUNDRED AND FORTY FOUR pages. Only the intro and acknowledgements remain to be finished. A street date hasn’t been officially announced, but it’ll be published by Feral House prior to Fall 2019.